Many bike shops give a discount to CTC (now Cycling UK) members. If you are a member, when going to a bike shop always carry your membership card and ask if they give a discount. Pedal Heaven is at 311 - 313 Fleet Road, GU51 3BT. Closed on Sundays, but open until 8 PM on Thursdays. If you don't have the time or wherewithal yourself, they will service your bike, from a basic service up to a complete strip-down, clean and lubrication, and reassembly. Cycling UK members get a 10% discount on non-sale items, excluding labour. 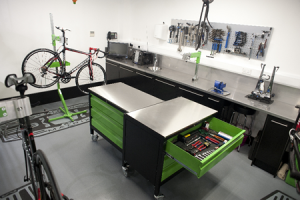 Pedal Heaven can also advise on adjusting your current bike, up to and including a complete bike-fitting session. This is a comprehensive bike/rider set up programme to look at every aspect of the rider on the bike. At the end of the process, you receive a report together with before and after images and videos; you should be able to ride further, faster and more comfortably on the bike. OK, so this isn't really local, but we recognise that many people in Fleet commute in to London Waterloo, and it's just around the corner from the station. Open 8 AM to 8 PM every weekday - handy for odd accessories, or just to browse around when your train home is delayed. 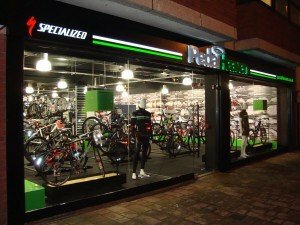 If you own a local shop selling bikes or bike-related items and wish to be listed on here, please email our webmaster as listed on the Contact Us page.